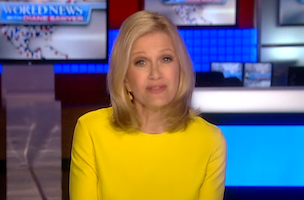 Diane Sawyer signed off as anchor of ABC’s “World News” Wednesday night after announcing yesterday on Twitter it would be her final broadcast. ABC said in June that Sawyer would soon step down after five years as anchor, to be replaced by the program’s weekend anchor David Muir. “And now it is time to say good night. And I just want you to know what a deep privilege it has been to sit in the anchor chair at ”World News” these years, the flag ship broadcast of ABC where Peter Jennings created a signature of such curiosity and courage. It has been wonderful to be the home port for the brave and brilliant forces of ABC News around the world and to feel every single night you and I were in a conversation about the day together. Sometimes, as we know, there have been tough stories on “World News,” but you always made it clear, like me, you believe better will come, that the future is one of possibility. And there has been so much to celebrate here as well, connections, community, America, and the generosity of our neighbors next door. I want you to know none of that will change. ”World News” is dedicated to what informs, and we always hope helps make your life better. On a personal note, as I said I’m not going far, down the hall, up the stairs, and I am not slowing down but gearing up in in a new way, already at work on some of the stories that take you into the real lives around us, the ones we rarely get to see. Click through for three videos from last night’s broadcast of “World News,” including a tribute to Sawyer, a thank you to her staff including many familiar Washington faces, and her well-wishes for Muir.